TORONTO, Ont. – Canadian spot market load volumes are soaring, as shown by TransCore’s Loadlink data. 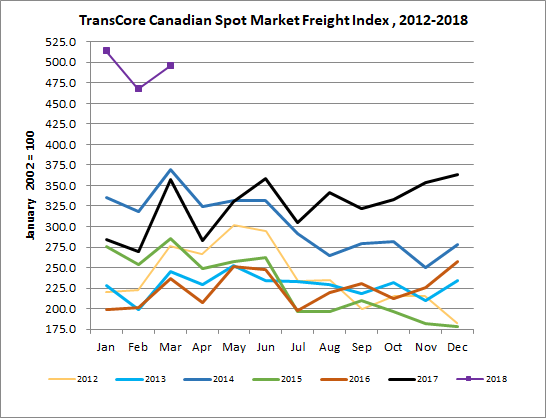 The year has started with high truckload volumes in all Canadian regions, TransCore reported, with the total number of loads posted and cross-border load volumes significantly outperforming any previous quarter on record. March volumes were up 6% compared to February and were 39% stronger year-over-year. First quarter volumes were up 41% over a strong Q4 2017, and increased 62% year-over-year. Alberta led the growth with a 41% increase in load volumes quarter-over-quarter. Western Canada saw load volumes spike 38%, Ontario 37%, Quebec 36%, and Atlantic Canada 30%. Load volumes in January, February and March were the highest ever recorded by Loadlink, TransCore reported. The highest month for load volumes was recorded in January. Truck postings also increased, by 15% compared to February. But they were still 28% lower than in March 2017. The truck-to-load ratio was 0.92, meaning there were more loads available than trucks to haul them. It was up slightly from 0.85 in February, but the ratio was 1.78 trucks for every load in March 2017.